Follow My Posts with Email Updates! Last month our married couples group had a wonderful event at the Aprons Publix Cooking School in Alpharetta, Georgia. We chopped, stirred, broiled and sautéed our way to a gourmet meal. If you are looking for something different to do or if you just love to cook, this is for you. Future classes at the cooking school. 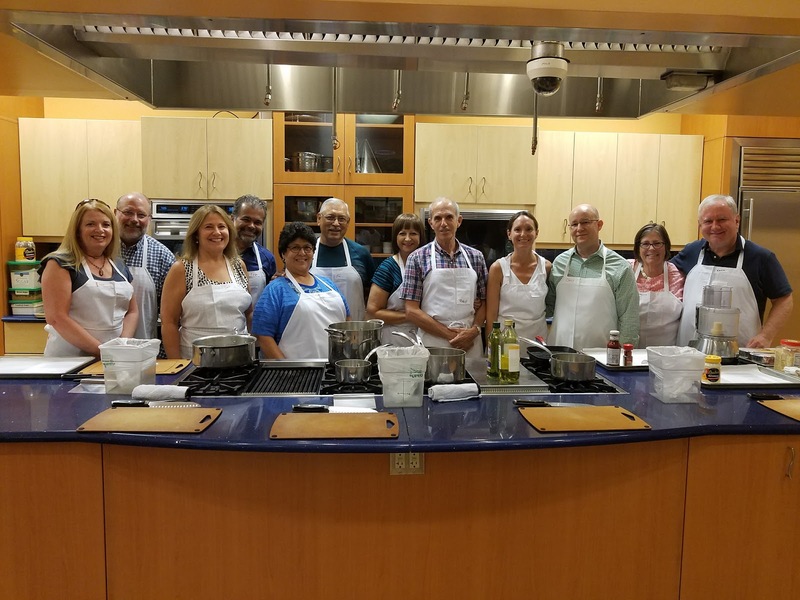 Here are the highlights from our event: Aprons Publix Cooking School Highlights. As always, if you would like to live near the Alpharetta Aprons Publix Cooking School or have any real estate needs, feel free to call me Pam Santoro at 678-656-6627 (cell) or 770-475-0505 (office) or check out my website www.pamsantoro.com . Remember No One Sells a Home Like a Mom! Lots of us are part of the sandwich generation raising our families and taking care of our parents. If you are feeling overwhelmed worrying about your parents or even planning for yourself, this workshop is for you. We’ll discuss topics like finances, assisted living, insurance, downsizing, moving, veteran’s benefits and more. 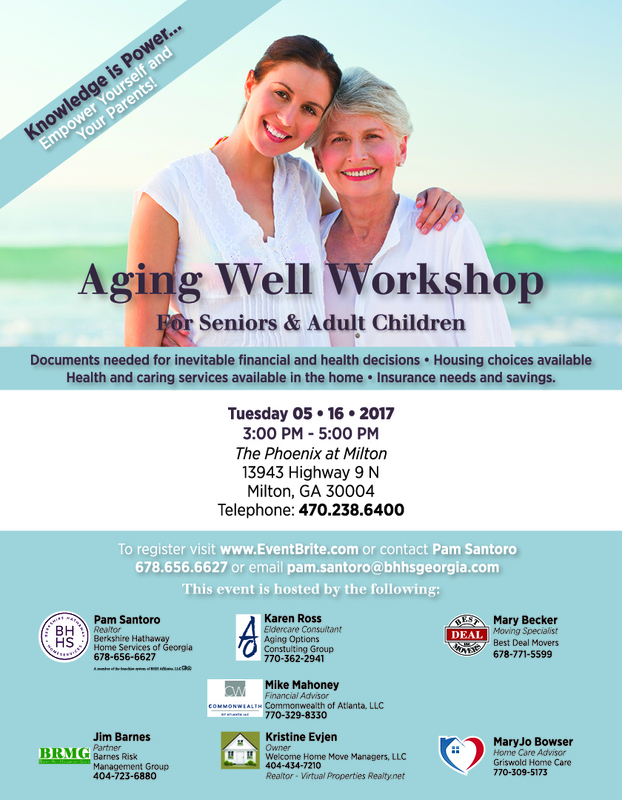 Please join us for the Aging Well Workshop (for Seniors and Adult Children) on Tuesday, September 12th, 2017 from 3PM to 5PM at Arbor Terrace of Johns Creek (next to Laurel Springs Subdivision), 3180 Karen White Drive, Suwanee, GA 30024 (770-790-0807). As always, if you have any real estate needs, feel free to call me Pam Santoro at 678-656-6627 or check out my website www.pamsantoro.com . Remember No One Sells a Home Like a Mom! Real Estate, My Son, and Thank You Tammy & Doug! One of the best parts of my job as a Realtor is helping wonderful clients buy their dream home, downsize or relocate to another state. Last Friday, my son, Greg, closed on his first house. I feel that all my clients become a part of my family, but this was my son who I watched grow up, go to college and become a productive member of society. It was very emotional for me. 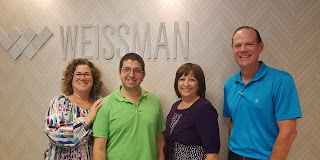 I want to thank Tammy Skinner at Weissman PC Attorneys at Law and Doug Mooney of Home Services Lending for taking care of all the details and making the closing go smoothly. Fantastic Walton High area, roomy kitchen with breakfast area, formal dining and living rooms, family room with cozy fire place, and bedroom on main, four spacious bedrooms on upper level with office, finished terrace level with full bath, neutral paint throughout, and private fenced yard. Ready for you to move right in. Please join me at the open house on Saturday, July 22nd, from 1PM to 3PM. This home has 5 bedrooms and 4 full bathrooms and is offered for lease at $3650 per month. For more information on 4530 Dartmoor Drive, please feel free to call me Pam Santoro at 678-656-6627 (cell) or 770-475-0505 (Office -Broker) or check out my website at www.pamsantoro.com . Remember No One Sells a Home Like a Mom! Lots of us are part of the sandwich generation raising our families and taking care of our parents. If you are feeling overwhelmed worrying about your parents or even planning for yourself, this workshop is for you. We'll discuss the documents needed for inevitable financial and health decisions, housing choices available, health and caring services available in the home, insurance needs and savings, and veterans benefits. As we age, good planning will make it easier on us and our children. These tips are especially helpful if you are coordinating the next steps for your parents and your in-laws. It seems as we age our roles with our aging parents are reversed. We become their caretakers or advocates. 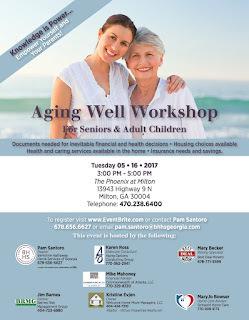 Please join us for the Aging Well Workshop (for Seniors and Adult Children) on Tuesday, May 16th from 3PM to 5PM at The Phoenix at Milton, 13943 Highway 9 N, Milton, GA 30004 (470-238-6400). Learn how to empower yourself and your parents. Beautiful updated ranch on private landscaped lot kept green by irrigation pump from pond. Home on deep well. Hardwoods on main. Kitchen features double convection ovens, gas range, and granite counters. Master suite with sitting area. Master bath features Travertine tile and 5x5 shower with dual heads. Screened porch overlooks pool. Finished terrace level has teen/in-law suite and second kitchen. Fish in your own pond. Most windows and two sliding glass doors have been replaced. All carpet replaced within last 2 years. Guest bath and full bath downstairs. Home has had renovations within the last two years. Vinyl in pool recently replaced. Home also features a security system, and a fenced backyard. 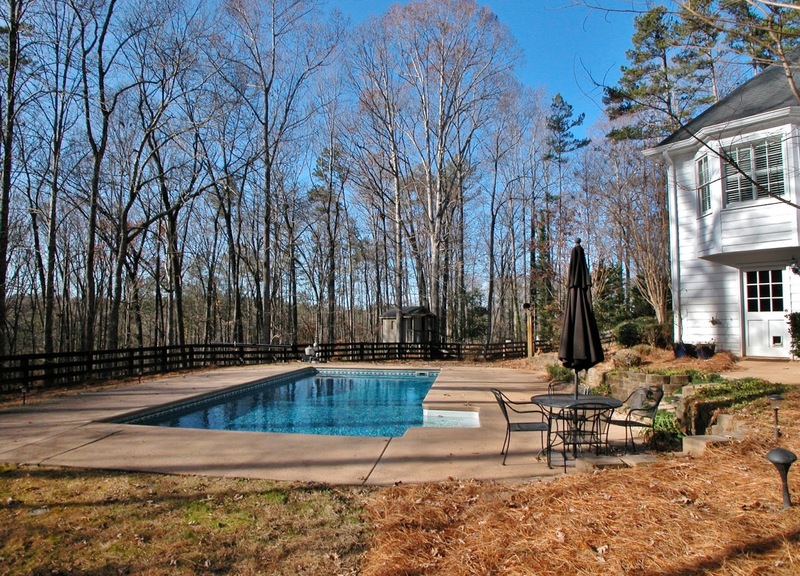 This spacious home is nestled on over 2 acres with 5 bedrooms, 3 full baths, 2 half baths, and pool. You can even fish in your own pond. 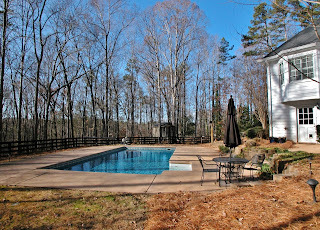 For more information, please contact me at 678-656-6627 or got to www.pamsantoro.com.